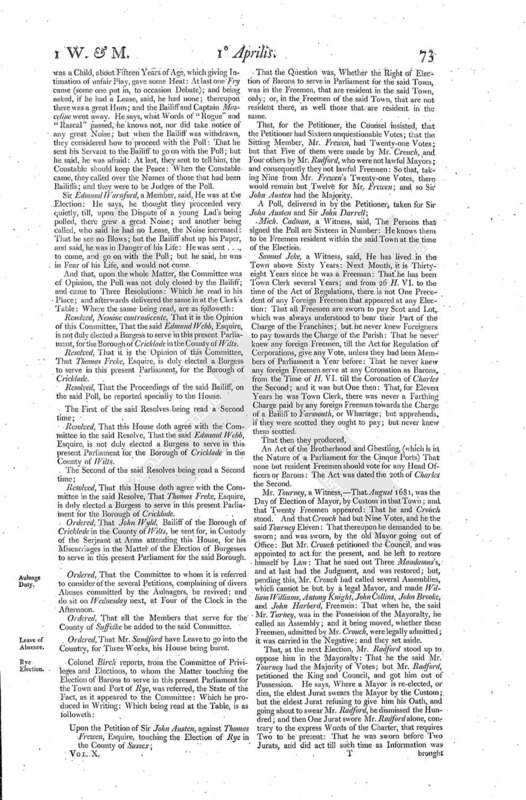 Journal of the House of Commons: Volume 10, 1688-1693. Originally published by His Majesty's Stationery Office, London, 1802. Lunæ, 1 die Aprilis; 1° Willielmi et Mariæ. Citizens fined for Riot at Guildhall, 1683. Repealing Act for governing Corporations. A PETITION of the common Brewers of the City and County of the City of Coventry; complaining of divers Abuses in the Gaugers for gauging and charging their Worts in the Coppers and Coolers, and not in the Tun; and returning it for Ale, whereas it was in truth Beer; and that they have not had those Allowances which the Law directs; and that they had applied to the Commissioners of the Excise and Justices of the Peace, but could have no Relief; and therefore praying Relief therein; was read. Resolved, That the Petition do lie upon the Table, to be considered when the Matter of the Revenue, touching the Excise, comes into Consideration. A Petition of divers Citizens, unjustly accused of a Riot at Guild-hall, 24 June 1682, and fined for the same 8 May 1683, was offered to be read. Resolved, That the Petition do lie upon the Table; and that the Petitioners do attend To-morrow Morning, to own the same. Upon the Petition of the Inhabitants of Marlbrough, against Sir John Ernly and Sir George Willoughby, Sitting Members. That the Question was, Whether the Election ought to be by the Mayor, and a select Number of Burgesses; or, by the Populace, paying Scot and Lot. That, for the Petitioners, their Council insisted, that there never was a Mayor till H. IV; and that, of common Right, the Inhabitants had a Right, unless the contrary was proved: That the Mayor was in time of Memory as before; and so he, and the select Number, could not prescribe to have the Right of Election. That it was also insisted, that the Number of the Burgesses were uncertain; sometimes more, sometimes less. And that they produced Returns, 28 E. I. pro Burgo.- 33 E. I. pro Communitate Burg' de Marlbrough.- 6 E. II. pro Burgo.-18 Eliz. A Charter.-of Mayor and Burgesses, to govern the Town, with several Inspeximus's. Also 23 Oct' 1640, a Return, under the Common Seal. That for the Sitting Member the Counsel insisted, that the Right of Election was in the Mayor, and select Number of Burgesses, which were about Fifty. And that Sir John Ernly had Forty-six, and Sir George Willoughby had Forty-five. And produced Indentures of Return 9 H. IV; 36 H. VIII; 7 E. VI; 1 Mar. : 1 and 2 Mar. : All mentioned to be under the Common Seal of Mayor and Burgesses. And that a Witness, the Town Clerk, proved, That he had lived at Marlbrough ever since 1636, and was formerly Clerk to the Town Clerk, and took the Poll upon several Elections, and had been Town Clerk himself 25 Years; and never heard of any popular Election, till 1679, that the Pretence of such a Right was set up: And that upon a Contest, touching That Election, Two Persons, who are dead, and had been conversant about Elections, testified and said (the One for Sixty, the other for Forty Years) they never knew of any Election by the Populacy. That there was read, the Return, made upon that Election, of the Lord Bruce and Mr. Bennet; and the Report and Resolution of the House upon the Contest of that Election, 24 December 1680; whereby it appeared, that they who had been chosen by the Mayor and select Number were duly elected. That it was also testified, That the free Burgesses had divers Privileges above the Inhabitants; as, that they were Toll-free, and that there was a Close of Eighty Acres always let to the free Burgesses. Resolved, That it is the Opinion of this Committee, That the Right of Election of Burgesses to serve in Parliament, for the Borough of Marlbrough in the County of Wilts, is in the Mayor, and select Number of Burgesses. 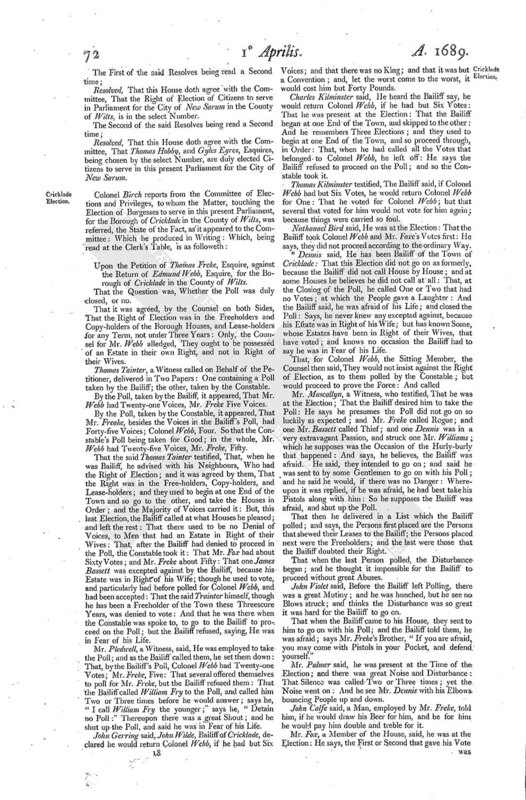 Resolved, That it is the Opinion of this Committee, That Sir John Ernly, Knight, and Sir George Willoughby, Knight, are duly elected Burgesses to serve in this present Parliament for the Borough of Marlbrough. Resolved, That the House doth agree with the Committee, That the Right of Election of Burgesses to serve in Parliament for the Borough of Marlbrough in the County of Wilts, is in the Mayor, and select Number of Burgesses. Resolved, That this House doth agree with the Committee, That Sir John Ernly, Knight, and Sir George Willoughby, Knight, are duly elected Burgesses to serve in this present Parliament for the Borough of Marlbrough. Upon the Petition of Sir Rob. Henley, and John Venables, Esquire, against Francis Pawlett and John Pollen, Esquires, the Sitting Members for the Borough of Andover. That the Question was, Whether the Election lay in the Bailiff, and select Number of Burgesses only; or, in the Populace. Also, a Writ for Electing of a Burgess for that Town, in the Place of Sir Henry Rainsford, then lately deceased; with the Return of the same, Anno 41, under the Seal of the Corporation: Which Return had been amended, and Sir William Waller's Name put in the Place of Sir Henry Vernon, originally returned. An Order of this House was likewise read, for the referring the Petition of Sir William Waller, touching the Election, to a Committee. Richard Butcher, a Witness, said, Sir William Waller in 41, was chosen by the Populace; for, he said, he heard them cry out A Waller! and that there was a Poll demanded: That he is aged about Sixty Years of Age; and was then about Fifteen Years of Age. William Erney, a Witness, aged Sixty-four Years, spake to the like effect. Another Witness-That there was a Petition against my Lord Delaware's Son, and Mr. Collins, in Oxford Parliament, upon the Right of the Populacy; but the Parliament was dissolved before it was determined. That in Westminster Parliament, Two Years before the Burgesses were chosen by the select Number: That, for the last Parliament before This, the Town had a Design to assert their Rights; but the Town Clerk threatened them to prosecute them for a Riot if they did. That for the sitting Members, the Counsel agreed the Question; but said further, That Andover was a Corporation by Prescription; and that the Election of Burgesses had always been by the select Number: They insisted that the Records of E. I. shewed there were then Members returned; but it did not appear by them who were the Electors. That they produced an ancient Book of the Corporation; by which it appeared, That several Courts had been held by the Maneloquiums, and an Order made per Senescallum, and 24 for Wardinos, 37 H. VI. That they produced their Charter; which recited, That they had been a Corporation of Time immemorial. Then where produced Indentures of Return, ss. of 28 Eliz. 1 Jac. 18 Jac. 21 Jac. 15 Car. I; under the Common Seal. John Dawling, Edward Cook, John Read, Witnesses, testified, They had known several Elections; and that all they remembered were by the select Number. Resolved, That it is the Opinion of this Committee, That the Right of Election of Burgesses to serve in Parliament for the Borough of Andover in the County of Southampton, is in the Bailiff, and select Number of Burgesses, only. Resolved, That it is the Opinion of this Committee, That Francis Powlett and John Pollen, Esquires, are duly elected Burgesses to serve in this present Parliament, for the Borough of Andover. Resolved, That this House doth agree with the Committee, That the Right of Election of Burgesses to serve in Parliament for the Borough of Andover in the County of Southampton, is in the Bailiff, and select Number of Burgesses, only. Resolved, That this House doth agree with the Committee, That Francis Powlett and John Pollen, Esquires, are duly elected Burgesses to serve in this present Parliament, for the Borough of Andover. 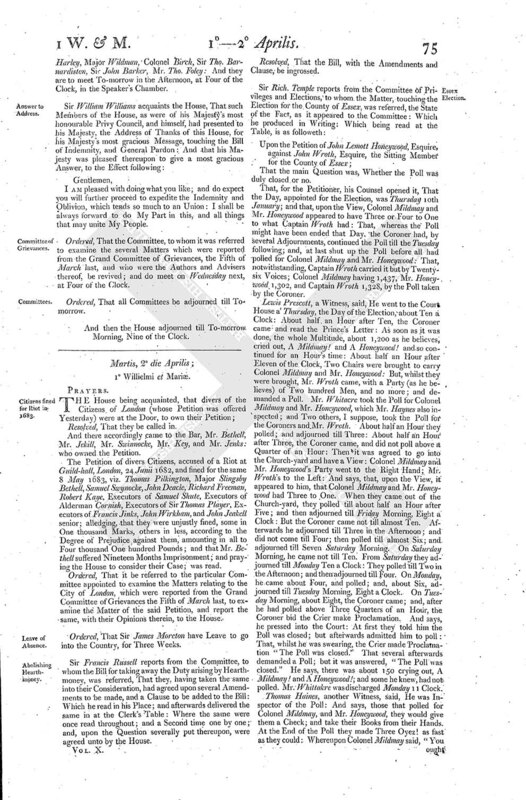 Upon the Petition of Samuel Eyres, Esquire, and David Thomas, Doctor in Physick, against Thomas Hobby, and Giles Eyres, Esquires, the Sitting Members for the City of New Sarum. 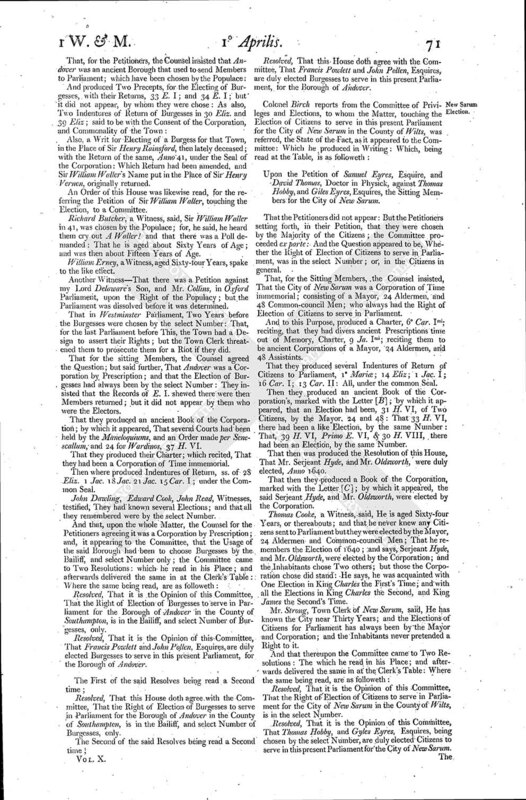 That the Petitioners did not appear: But the Petitioners setting forth, in their Petition, that they were chosen by the Majority of the Citizens; the Committee proceeded ex parte: And the Question appeared to be, Whether the Right of Election of Citizens to serve in Parliament, was in the select Number; or, in the Citizens in general. That, for the Sitting Members, the Counsel insisted, That the City of New Sarum was a Corporation of Time immemorial; consisting of a Mayor, 24 Aldermen, and 48 Common-council Men; who always had the Right of Election of Citizens to serve in Parliament. And to this Purpose, produced a Charter, 6° Car. Imi; reciting, that they had divers ancient Prescriptions time out of Memory, Charter, 9 Ja. Imi; reciting them to be ancient Corporations of a Mayor, 24 Aldermen, and 48 Assistants. That they produced several Indentures of Return of Citizens to Parliament, 1 Mariæ; 14 Eliz; 1 Jac. I; 16 Car. I; 13 Car. II: All, under the common Seal. Then they produced an ancient Book of the Corporation's, marked with the Letter [B]; by which it appeared, that an Election had been, 31 H. VI, of Two Citizens, by the Mayor, 24 and 48 : That 33 H. VI, there had been a like Election, by the same Number: That, 39 H. VI, Primo E. VI, & 30 H. VIII, there had been an Election, by the same Number. That then was produced the Resolution of this House, That Mr. Serjeant Hyde, and Mr. Oldsworth, were duly elected, Anno 1640. That then they produced a Book of the Corporation, marked with the Letter `C]; by which it appeared, the said Serjeant Hyde, and Mr. Oldsworth, were elected by the Corporation. Thomas Cooke, a Witness, said, He is aged Sixty-four Years, or thereabouts; and that he never knew any Citizens sent to Parliament but they were elected by the Mayor, 24 Aldermen and Common-council Men; That he remembers the Election of 1640; and says, Serjeant Hyde, and Mr. Oldsworth, were elected by the Corporation; and the Inhabitants chose Two others; but those the Corporation chose did stand: He says, he was acquainted with One Election in King Charles the First's Time; and with all the Elections in King Charles the Second, and King James the Second's Time. Mr. Strong, Town Clerk of New Sarum, said, He has known the City near Thirty Years; and the Elections of Citizens for Parliament has always been by the Mayor and Corporation; and the Inhabitants never pretended a Right to it. Resolved, That it is the Opinion of this Committee, That the Right of Election of Citizens to serve in Parliament for the City of New Sarum in the County of Wilts, is in the select Number. Resolved, That it is the Opinion of this Committee, That Thomas Hobby, and Gyles Eyres, Esquires, being chosen by the select Number, are duly elected Citizens to serve in this present Parliament for the City of New Sarum. Resolved, That this House doth agree with the Committee, That the Right of Election of Citizens to serve in Parliament for the City of New Sarum in the County of Wilts, is in the select Number. Resolved, That this House doth agree with the Committee, That Thomas Hobby, and Gyles Eyres, Esquires, being chosen by the select Number, are duly elected Citizens to serve in this present Parliament for the City of New Sarum. Upon the Petition of Thomas Freke, Esquire, against the Return of Edmund Webb, Esquire, for the Borough of Cricklade in the County of Wilts. That the Question was, Whether the Poll was duly closed, or no. That it was agreed, by the Counsel on both Sides, That the Right of Election was in the Freeholders and Copy-holders of the Borough Houses, and Lease-holders for any Term, not under Three Years: Only, the Counsel for Mr. Webb alledged, They ought to be possessed of an Estate in their own Right, and not in Right of their Wives. Thomas Tainter, a Witness called on Behalf of the Petitioner, delivered in Two Papers: One containing a Poll taken by the Bailiff; the other, taken by the Constable. By the Poll, taken by the Bailiff, it appeared, That Mr. Webb had Twenty-one Voices, Mr. Freke Five Voices. By the Poll, taken by the Constable, it appeared, That Mr. Freake, besides the Voices in the Bailiff's Poll, had Forty-five Voices; Colonel Webb, Four. So that the Constable's Poll being taken for Good; in the whole, Mr. Webb had Twenty-five Voices, Mr. Freke, Fifty. That the said Thomas Tainter testified, That, when he was Bailiff, he advised with his Neighbours, Who had the Right of Election; and it was agreed by them, That the Right was in the Free-holders, Copy-holders, and Lease-holders; and they used to begin at one End of the Town and so go to the other, and take the Houses in Order; and the Majority of Voices carried it: But, this last Election, the Bailiff called at what Houses he pleased; and left the rest: That there used to be no Denial of Voices, to Men that had an Estate in Right of their Wives: That, after the Bailiff had denied to proceed in the Poll, the Constable took it: That Mr. Fox had about Sixty Votes; and Mr. Freke about Fifty: That one James Bassett was excepted against by the Bailiff, because his Estate was in Right of his Wife; though he used to vote, and particularly had before polled for Colonel Webb, and had been accepted: That the said Trainter himself, though he has been a Freeholder of the Town these Threescore Years, was denied to vote: And that he was there when the Constable was spoke to, to go to the Bailiff to proceed on the Poll; but the Bailiff refused, saying, He was in Fear of his Life. Mr. Pledwell, a Witness, said, He was employed to take the Poll; and as the Bailiff called them, he set them down: That, by the Bailiff's Poll, Colonel Webb had Twenty-one Votes; Mr. Freke, Five: That several offered themselves to poll for Mr. Freke, but the Bailiff refused them: That the Bailiff called William Fry to the Poll, and called him Two or Three times before he would answer; says he, "I call William Fry the younger;" says he, "Detain no Poll:" Thereupon there was a great Shout; and he shut up the Poll, and said he was in Fear of his Life. John Gerring said, John Wilde, Bailiff of Cricklade, declared he would return Colonel Webb, if he had but Six Voices; and that there was no King; and that it was but a Convention; and, let the worst come to the worst, it would cost him but Forty Pounds. Charles Kilminster said, He heard the Bailiff say, he would return Colonel Webb, if he had but Six Votes: That he was present at the Election: That the Bailiff began at one End of the Town, and skipped to the other: And he remembers Three Elections; and they used to begin at one End of the Town, and so proceed through, in Order: That, when he had called all the Votes that belonged to Colonel Webb, he left off: He says the Bailiff refused to proceed on the Poll; and so the Constable took it. Thomas Kilminster testified, The Bailiff said, if Colonel Webb had but Six Votes, he would return Colonel Webb for One: That he voted for Colonel Webb; but that several that voted for him would not vote for him again; because things were carried so foul. Nathanael Bird said, He was at the Election: That the Bailiff took Colonel Webb and Mr. Foxe's Votes first: He says, they did not proceed according to the ordinary Way. *Dennis said, He has been Bailiff of the Town of Cricklade: That this Election did not go on as formerly, because the Bailiff did not call House by House; and at some Houses be believes he did not call at all: That, at the Closing of the Poll, he called One or Two that had no Votes; at which the People gave a Laughter: And the Bailiff said, he was afraid of his Life; and closed the Poll: Says, he never knew any excepted against, because his Estate was in Right of his Wife; but has known Some, whose Estates have been in Right of their Wives, that have voted; and knows no occasion the Bailiff had to say he was in Fear of his Life. Mr. Mascallyn, a Witness, who testified, That he was at the Election; That the Bailiff desired him to take the Poll: He says he presumes the Poll did not go on so luckily as expected; and Mr. Freke called Rogue; and one Mr. Bassett called Thief; and one Dennis was in a very extravagant Passion, and struck one Mr. Williams; which he supposes was the Occasion of the Hurly-burly that happened: And says, he believes, the Bailiff was afraid. He said, they intended to go on; and said he was sent to by some Gentlemen to go on with his Poll; and he said he would, if there was no Danger: Whereupon it was replied, if he was afraid, he had best take his Pistols along with him: So he supposes the Bailiff was afraid, and shut up the Poll. That then he delivered in a List which the Bailiff polled; and says, the Persons first placed are the Persons that shewed their Leases to the Bailiff; the Persons placed next were the Freeholders; and the last were those that the Bailiff doubted their Right. That when the last Person polled, the Disturbance began; and he thought it impossible for the Bailiff to proceed without great Abuses. John Violet said, Before the Bailiff left Polling, there was a great Mutiny; and he was hunched, but he see no Blows struck; and thinks the Disturbance was so great it was hard for the Bailiff to go on. That when the Bailiff came to his House, they sent to him to go on with his Poll; and the Bailiff told them, he was afraid; says Mr. Freke's Brother, "If you are afraid, you may come with Pistols in your Pocket, and defend yourself." Mr. Palmer said, he was present at the Time of the Election; and there was great Noise and Disturbance: That Silence was called Two or Three times; yet the Noise went on: And he see Mr. Dennis with his Elbows bouncing People up and down. John Calfe said, a Man, employed by Mr. Freke, told him, if he would draw his Beer for him, and be for him he would pay him double and treble for it. Mr. Fox, a Member of the House, said, he was at the Election: He says, the First or Second that gave his Vote was a Child, about Fifteen Years of Age, which giving Intimation of unfair Play, gave some Heat: At last one Fry came (some one put in, to occasion Debate); and being asked, if he had a Lease, said, he had none; there upon there was a great Hum; and the Bailiff and Captain Masceline went away. He says, what Words of "Rogue" and "Rascal" passed; he knows not, nor did take notice of any great Noise; but when the Bailiff was withdrawn, they considered how to proceed with the Poll: That he sent his Servant to the Bailiff to go on with the Poll; but he said, he was afraid: At last, they sent to tell him, the Constable should keep the Peace: When the Constable came, they called over the Names of those that had been Bailiffs; and they were to be Judges of the Poll. Sir Edmund Warnford, a Member, said, He was at the Election: He says, he thought they proceeded very quietly, till, upon the Dispute of a young Lad's being polled, there grew a great Noise; and another being called, who said he had no Lease, the Noise increased: That he see no Blows; but the Bailiff shut up his Paper, and said, he was in Danger of his Life: He was sent . . ., to come, and go on with the Poll; but he said, he was in Fear of his Life, and would not come. Resolved, Nemine contradicente, That it is the Opinion of this Committee, That the said Edmund Webb, Esquire, is not duly elected a Burgess to serve in this present Parliament, for the Borough of Cricklade in the County of Wilts. 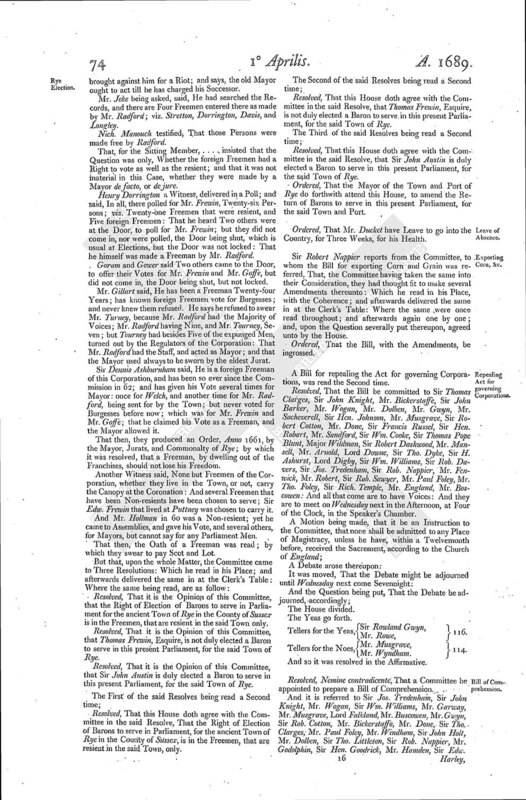 Resolved, That it is the Opinion of this Committee, That Thomas Freke, Esquire, is duly elected a Burgess to serve in this present Parliament, for the Borough of Cricklade. Resolved, That the Proceedings of the said Bailiff, on the said Poll, be reported specially to the House. Resolved, That this House doth agree with the Committee in the said Resolve, That the said Edmund Webb, Esquire, is not duly elected a Burgess to serve in this present Parliament for the Borough of Cricklade in the County of Wilts. Resolved, That this House doth agree with the Committee in the said Resolve, That Thomas Freke, Esquire, is duly elected a Burgess to serve in this present Parliament for the Borough of Cricklade. Ordered, That John Wyld, Bailiff of the Borough of Cricklade in the County of Wilts, be sent for, in Custody of the Serjeant at Arms attending this House, for his Miscarriages in the Matter of the Election of Burgesses to serve in this present Parliament for the said Borough. Ordered, That the Committee to whom it is referred to consider of the several Petitions, complaining of divers Abuses committed by the Aulnagers, be revived; and do sit on Wednesday next, at Four of the Clock in the Afternoon. Ordered, That all the Members that serve for the County of Suffolke be added to the said Committee. Ordered, That Mr. Sandford have Leave to go into the Country, for Three Weeks, his House being burnt. That the Question was, Whether the Right of Election of Barons to serve in Parliament for the said Town, was in the Freemen, that are resident in the said Town, only; or, in the Freemen of the said Town, that are not resident there, as well those that are resident, in the same. That, for the Petitioner, the Counsel insisted, that the Petitioner had Sixteen unquestionable Votes; that the Sitting Member, Mr. Frewen, had Twenty-one Votes; but that Five of them were made by Mr. Crouch, and Four others by Mr. Radford, who were not lawful Mayors; and consequently they not lawful Freemen: So that, taking Nine from Mr. Frewen's Twenty-one Votes, there would remain but Twelve for Mr. Frewen; and so Sir John Austen had the Majority. Mich. Cadman, a Witness, said, The Persons that signed the Poll are Sixteen in Number: He knows them to be Freemen resident within the said Town at the time of the Election. Samuel Jeke, a Witness, said, He has lived, in the Town above Sixty Years: Next Month, it is Thirtyeight Years since he was a Freeman: That he has been Town Clerk several Years; and from 26 H. VI. to the time of the Act of Regulations, there, is not One Precedent of any Foreign Freemen that appeared at any Election: That all Freemen are sworn to pay Scot and Lot, which was always understood to bear their Part of the Charge of the Franchises; but he never knew Foreigners to pay towards the Charge of the Parish: That he never knew any foreign Freemen, till the Act for Regulation of Corporations, give any Vote, unless they had been Members of Parliament a Year before: That he never knew any foreign Freemen serve at any Coronation as Barons, from the Time of H. VI. till the Coronation of Charles the Second; and it was but One then: That, for Eleven Years he was Town Clerk, there was never a Farthing Charge paid by any foreign Freeman towards the Charge of a Bailiff to Yarmouth, or Wharsage; but apprehends, if they were scotted they ought to pay; but never knew them scotted. 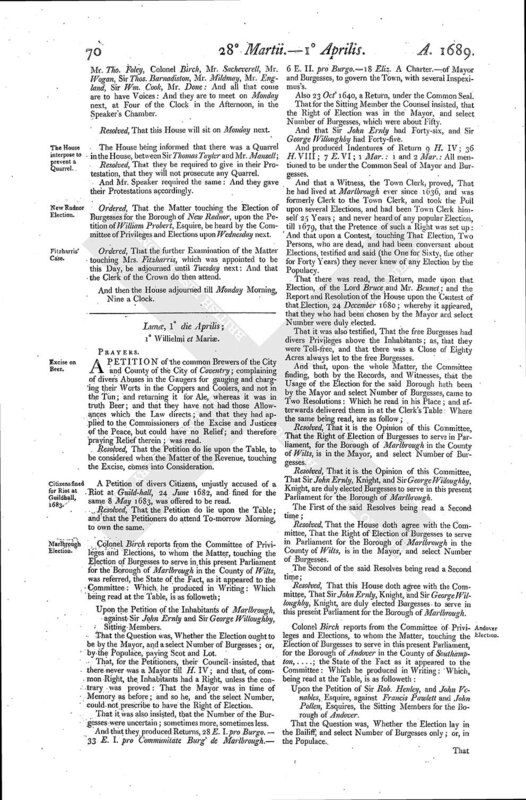 An Act of the Brotherhood and Ghestling, (which is in the Nature of a Parliament for the Cinque Ports) That none but resident Freemen should vote for any Head Officers or Barons: The Act was dated the 20th of Charles the Second. Mr. Tourney, a Witness,-That August 1681, was the Day of Election of Mayor, by Custom in that Town; and that Twenty Freemen appeared: That he and Crouch stood. And that Crouch had but Nine Votes, and he the said Tourney Eleven: That thereupon he demanded to be sworn; and was sworn, by the old Mayor going out of Office: But Mr. Crouch petitioned the Council, and was appointed to act for the present, and he left to restore himself by Law: That he sued out Three Mandamus's, and at last had the Judgment, and was restored; but, pending this, Mr. Crouch had called several Assemblies, which cannot be but by a legal Mayor, and made William Williams, Antony Knight, John Collins, John Brooke, and John Harberd, Freemen: That when he, the said Mr. Turney, was in the Possession of the Mayoralty, he called an Assembly; and it being moved, whether these Freemen, admitted by Mr. Crouch, were legally admitted; it was carried in the Negative; and they set aside. That, at the next Election, Mr. Radford stood up to oppose him in the Mayoralty: That he the said Mr. Tourney had the Majority of Votes; but Mr. Radford, petitioned the King and Council, and got him out of Possession. He says, Where a Mayor is re-elected, or dies, the eldest Jurat swears the Mayor by the Custom; but the eldest Jurat refusing to give him his Oath, and going about to swear Mr. Radford, he dismissed the Hundred; and then One Jurat swore Mr. Radford alone, contrary to the express Words of the Charter, that requires Two to be present: That he was sworn before Two Jurats, and did act till such time as Information was brought against him for a Riot; and says, the old Mayor ought to act till he has charged his Successor. Mr. Jeke being asked, said, He had searched the Records, and there are Four Freemen entered there as made by Mr. Radford; viz. Stretton, Dorrington, Davis, and Longley. Nich. Manouch testified, That those Persons were made free by Radford. That, for the Sitting Member, . . . . insisted that the Question was only, Whether the foreign Freemen had a Right to vote as well as the resient; and that it was not material in this Case, whether they were made by a Mayor de facto, or de jure. Henry Dorrington a Witness, delivered in a Poll; and said, In all, there polled for Mr. Frewin, Twenty-six Persons; viz. Twenty-one Freemen that were resient, and Five foreign Freemen: That he heard Two others were at the Door, to poll for Mr. Frewin; but they did not come in, nor were polled, the Door being shut, which is usual at Elections, but the Door was not locked: That he himself was made a Freeman by Mr. Radford. Goram and Gower said Two others came to the Door, to offer their Votes for Mr. Frewin and Mr. Goffe, but did not come in, the Door being shut, but not locked. Mr. Gillart said, He has been a Freeman Twenty-four Years; has known foreign Freemen vote for Burgesses; and never knew them refused. He says he refused to swear Mr. Turney, because Mr. Radford had the Majority of Voices; Mr. Radford having Nine, and Mr. Tourney, Seven; but Tourney had besides Five of the expunged Men, turned out by the Regulators of the Corporation: That Mr. Radford had the Staff, and acted as Mayor; and that the Mayor used always to be sworn by the eldest Jurat. Sir Dennis Ashburnham said, He is a foreign Freeman of this Corporation, and has been so ever since the Commission in 62; and has given his Vote several times for Mayor: once for Welch, and another time for Mr. Radford, being sent for by the Town; but never voted for Burgesses before now; which was for Mr. Frewin and Mr. Goffe; that he claimed his Vote as a Freeman, and the Mayor allowed it. That then, they produced an Order, Anno 1661, by the Mayor, Jurats, and Commonalty of Rye; by which it was resolved, that a Freeman, by dwelling out of the Franchises, should not lose his Freedom. Another Witness said, None but Freemen of the Corporation, whether they live in the Town, or not, carry the Canopy at the Coronation: And several Freemen that have been Non-resients have been chosen to serve; Sir Edw. Frewin that lived at Puttney was chosen to carry it. And Mr. Hollman in 60 was a Non-resient; yet he came to Assemblies, and gave his Vote, and several others, for Mayors, but cannot say for any Parliament Men. That then, the Oath of a Freeman was read; by which they swear to pay Scot and Lot. Resolved, That it is the Opinion of this Committee, that the Right of Election of Barons to serve in Parliament for the ancient Town of Rye in the County of Sussex is in the Freemen, that are resient in the said Town only. Resolved, That it is the Opinion of this Committee, that Thomas Frewin, Esquire, is not duly elected a Baron to serve in this present Parliament, for the said Town of Rye. Resolved, That it is the Opinion of this Committee, that Sir John Austin is duly elected a Baron to serve in this present Parliament, for the said Town of Rye. Resolved, That this House doth agree with the Committee in the said Resolve, That the Right of Election of Barons to serve in Parliament, for the ancient Town of Rye in the County of Sussex, is in the Freemen, that are resient in the said Town, only. Resolved, That this House doth agree with the Committee in the said Resolve, that Thomas Frewin, Esquire, is not duly elected a Baron to serve in this present Parliament, for the said Town of Rye. Resolved, That this House doth agree with the Committee in the said Resolve, that Sir John Austin is duly elected a Baron to serve in this present Parliament, for the said Town of Rye. Ordered, That the Mayor of the Town and Port of Rye do forthwith attend this House, to amend the Return of Barons to serve in this present Parliament, for the said Town and Port. Ordered, That Mr. Ducket have Leave to go into the Country, for Three Weeks, for his Health. Sir Robert Nappier reports from the Committee, to whom the Bill for exporting Corn and Grain was referred, That, the Committee having taken the same into their Consideration, they had thought fit to make several Amendments thereunto: Which he read in his Place, with the Coherence; and afterwards delivered the same in at the Clerk's Table: Where the same were once read throughout; and afterwards again one by one; and, upon the Question severally put thereupon, agreed unto by the House. A Bill for repealing the Act for governing Corporations, was read the Second time. Resolved, That the Bill be committed to Sir Thomas Clarges, Sir John Knight, Mr. Bickerstaffe, Sir John Barker, Mr. Wogan, Mr. Dolben, Mr. Gwyn, Mr. Sacheverell, Sir Hen. Johnson, Mr. Musgrave, Sir Robert Cotton, Mr. Done, Sir Francis Russel, Sir Hen. Robart, Mr. Sandford, Sir Wm. Cooke, Sir Thomas Pope Blunt, Major Wildman, Sir Robert Dashwood, Mr. Mansell, Mr. Arnold, Lord Downe, Sir Tho. Dyke, Sir H. Ashurst, Lord Digby, Sir Wm. Williams, Sir Rob. Davers, Sir Jos. Tredenham, Sir Rob. Nappier, Mr. Fenwick, Mr. Robert, Sir Rob. Sawyer, Mr. Paul Foley, Mr. Tho. Foley, Sir Rich. Temple, Mr. England, Mr. Boscowen: And all that come are to have Voices: And they are to meet on Wednesday next in the Afternoon, at Four of the Clock, in the Speaker's Chamber. Tellers for the Yeas, Sir Rowland Gwyn, 116. Tellers for the Noes, Mr. Musgrave, 114. Resolved, Nemine contradicente, That a Committee be appointed to prepare a Bill of Comprehension. And it is referred to Sir Jos. Tredenham, Sir John Knight, Mr. Wogan, Sir Wm. Williams, Mr. Garway, Mr. Musgrave, Lord Falkland, Mr. Buscowen, Mr. Gwyn, Sir Rob. Cotton, Mr. Bicker staffe, Mr. Done, Sir Tho. Clarges, Mr. Paul Foley, Mr. Windham, Sir John Holt, Mr. Dolben, Sir Tho. Littleton, Sir Rob. Nappier, Mr. Godolphin, Sir Hen. Goodrick, Mr. Hamden, Sir Edw. Harley, Major Wildman, Colonel Birch, Sir Tho. Barnardiston, Sir John Barker, Mr. Tho. Foley: And they are to meet To-morrow in the Afternoon, at Four of the Clock, in the Speaker's Chamber. I am pleased with doing what you like; and do expect you will further proceed to expedite the Indemnity and Oblivion, which tends so much to an Union: I shall be always forward to do My Part in this, and all things that may unite My People. Ordered, That the Committee, to whom it was referred to examine the several Matters which were reported from the Grand Committee of Grievances, the Fifth of March last, and who were the Authors and Advisers thereof, be revived; and do meet on Wednesday next, at Four of the Clock. Ordered, That all Committees be adjourned till Tomorrow. And then the House adjourned till To-morrow Morning, Nine of the Clock.